Keeping in mind that the “Don’t Knows” almost always vote “No,” it’s clear that the income measure never had much of a chance. The forecast “Yes” vote never even came close to 50 percent. It’s interesting that the highly expensive “No” campaign barely made a dent. That was probably because the income tax started in such a poor position in the first place. Random sample of 200 live telephone interviews of likely May 2011 Eugene Special Election voters from each of April 18-19, April 25-26, May 2-3, and May 9-10, 2011. Margin of error for each survey at the sample median is 7 percent. In this case, there was no clear drop. In part this was because it was ignored by both sides during the campaign. It also reflects that the needs were widely recognized. The 2008 Torrey mayoral campaign picked latent need this up and pushed this issue to the top of the agenda. QUESTION: If the election were held today, would you vote yes or no on Measure 20-132: City Gas Tax: Shall city increase Business License Tax paid by fuel dealers by 3 cents per gallon? IF YES/NO: Is that strongly or somewhat? IF DON’T KNOW: Which way do you lean? METHODOLOGY: Random sample of 200 live telephone interviews of likely November 2007 Eugene Special Election voters from each of September 10-11, October 15-16, October 22-23, and October 29-30, 2007. Margin of error for each survey at the sample median is 7 percent. This is an example of a measure not starting off well and dropping over time. 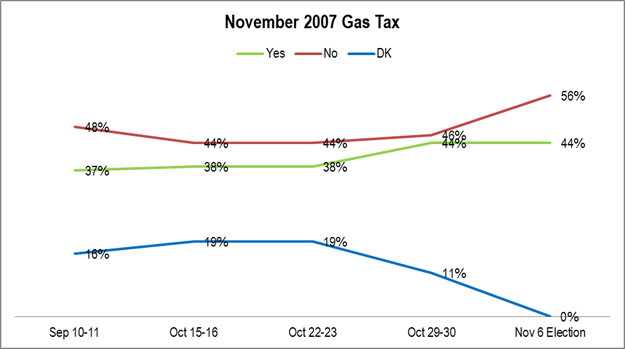 The measure received 36 percent Yes on November 6, 2007. 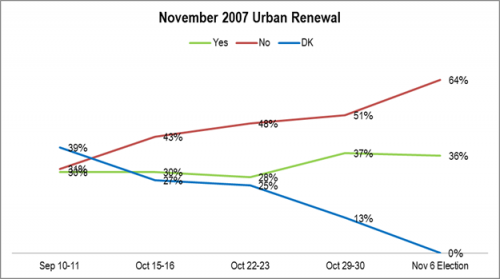 If the election were held today, would you vote yes or no on Measure 20-134: Downtown Urban Renewal Plan Amendment: Shall urban renewal plan be amended to increase the spending limit by $40 million and extend the plan’s ending date? Random sample of 200 live telephone interviews of likely November 2007 Eugene Special Election voters from each of September 10-11, October 15-16, October 22-23, and October 29-30, 2007. Margin of error for each survey at the sample median is 7 percent. The wins by the property tax measures were by landslides. 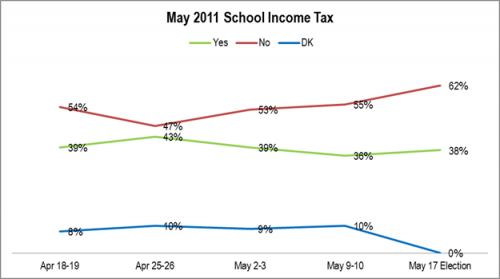 The losses by the non property tax measures were not close. They were slaughtered in the end. 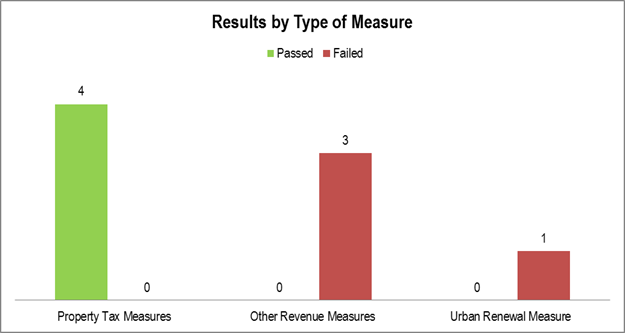 Included in the analysis are: Four Property Tax Measures Three New Tax Measures One Other (Urban Renewal) Measure. The eight measures included in this analysis are: November 2006 Library Measure November 2006 Parks Measure November 2007 Urban Renewal November 2007 Gas Tax November 2008 Roads Measure May 2011 School Income Tax November 2012 Roads Measure May 2013 Service Fee. Sources: City of Eugene Elections, Lane County Elections. 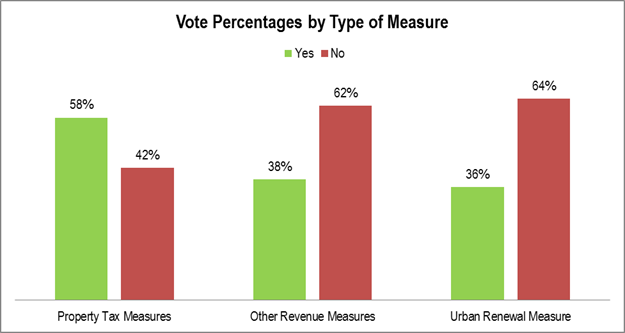 One of the key factors in money measure passage is trust in the government. Other factors include size in dollar terms, the underlying need being satisfied and the state of the economy. Eugeneans, and Oregonians in general, are very familiar with property taxes. New kinds of taxes require extra trust. In recent years, they have been much less likely to pass. Included in the analysis are: Four Property Tax Measures Three New Tax Measures One Other (Urban Renewal) Measure The eight measures included are: November 2006 Library Measure November 2006 Parks Measure November 2007 Urban Renewal November 2007 Gas Tax November 2008 Roads Measure May 2011 School Income Tax November 2012 Roads Measure May 2013 Service Fee. The City of Eugene is considering new revenue sources. As part of looking towards the future it is important to know what the past, and particularly the recent past, has been. To this end, for the next few weeks, this blog will post an extended analysis of the Eugene money measures during Mayor Piercy’s tenure. Support for money measures is a key indicator of confidence in a local government and its leader. Voters get a chance to put their money where their mouth is. In general, the voting is a function of measure size, government trust, need to be satisfied and the state of the local economy. Kitty Piercy’s net favorability remains underwater – ever since the proposed fee’s landslide loss in May. Unlike other drops, this appears to be something long term. 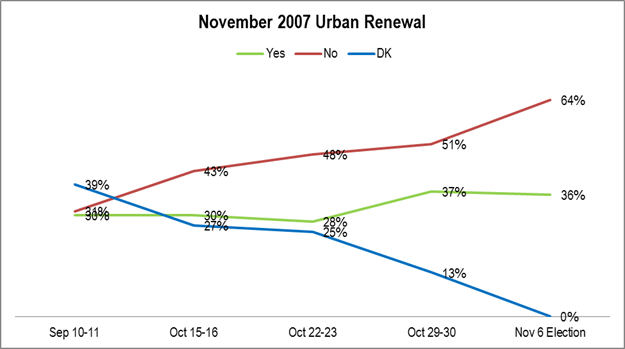 METHODOLOGY 200 live telephone interviews of a random sample of likely 2014 City of Eugene General Election voters were conducted each of January 23-24, 2013, June 10-11, 2013, September 23-24, 2013, and December 4-5, 2013. The margin of error at the sample median is 7 percent. Comparing with the previous post, Farr caught up to and passed Handy. Now, we are left with a bit of a puzzle. 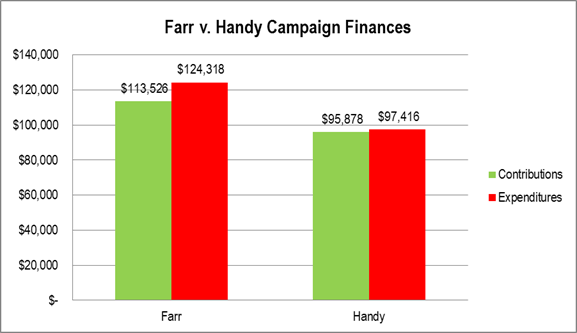 Pro-business challenger Pat Farr raised less earlier and more later than progressive incumbent Rob Handy. 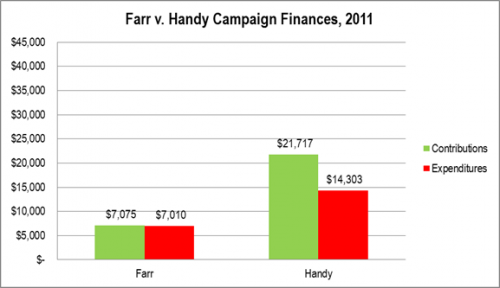 Will fundraising and expenditures in the 2014 East Lane and West Lane contests be anything like the 2012 Farr v. Handy race? And, if so, will they have more of the incumbent versus challenger or the business versus progressive feel? Time will tell. These figures include the 2011 and 2012 figures combined. The totals for the 2014 election will roll over just like they did for the 2012 election and the 2013 data will be harder to access. This quirk of the Oregon reporting system tricked some of the unwary in 2012. By way of comparison, this shows where things were on New Years’ Day 2012 in the Farr v. Handy race. Farr defeated Handy in a landslide by about 30 percentage points. 1. Progressive candidates tend to raise money earlier than business candidates. In this case, Bozievich and Stewart should not be worried. 2. 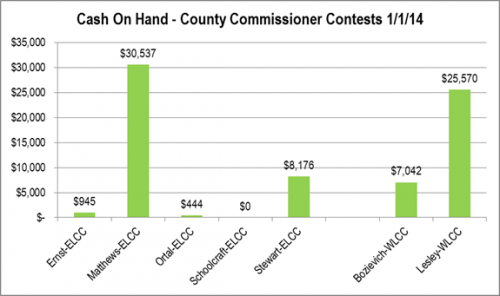 Incumbents tend to raise money earlier than business candidates. In this case, Bozievich and Stewart should be worried. The next post will expand on these two points. The cash on hand reflects the contribution differences (contributions minus expenditures). Lesley and Matthews are way ahead of Bozievich and Stewart. Sources: Oregon Secretary of State; Lane County Elections.